★ LOOGAROO ★: 2007 FATKAT OSCARS! On Friday April 27th we had our first of what will be an annual event. 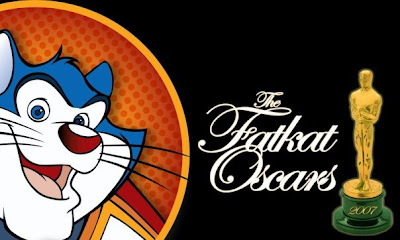 We had the 2007 Fatkat Oscar awards! This event was combined with our grand opening party to celebrate being in Miramichi and to celebrate the great folks, internally and externally that contribute to our success every week. People like Patrick Proulx the Fatkat Artist of the year and ACOA who helps us with all of our expansion needs. There are so many others too though. Perhaps We should just look at some pictures!! The Honorable Bill Frazer wins! Brian Donovan of Enterprize Miramichi takes home some gold! Justin Coffee a designer here at Fatkat takes home the Oscar for Best Hair! The Honorable Jon Foran takes home an Oscar! Greg McNulty off CBDC takes home some hardware! Cliff Walker took home the brass for Best Attitude! Sean Rule took home the goodness for Most Improved Animator. Richard Cyr from NBFILM took home utencils! Mayor John McKay got a some gold! Our Banker Nan MacDonald from RBC brought home their first Oscar. Tracy Fernandez won for Best Dressed! Rick Llyod from BDC took home the golden idol! Lauren Grieman won the Oscar for Best Laugh! And of course for Fatkat Animator of the year - Patrick Proulx. A good time had by all. See some more photos here! Facebook Picture Album of the 2007 Fatkat Oscars! Much love, and thanks for all of the support!